The European Union (EU) has become one of the favorite destinations for Chinese outbound foreign direct investment (OFDI). Annual Chinese OFDI in the 28 EU economies has grown from EUR 700 million in 2008 to EUR 35 billion in 2016. In 2017, Chinese investment in the EU dropped to EUR 30 billion, the first decline in four years, in the wake of China’s regulatory crackdown on outbound capital flows. A new report, delivered by the Mercator Institute for China Studies and Rhodium Group, explores these trends. 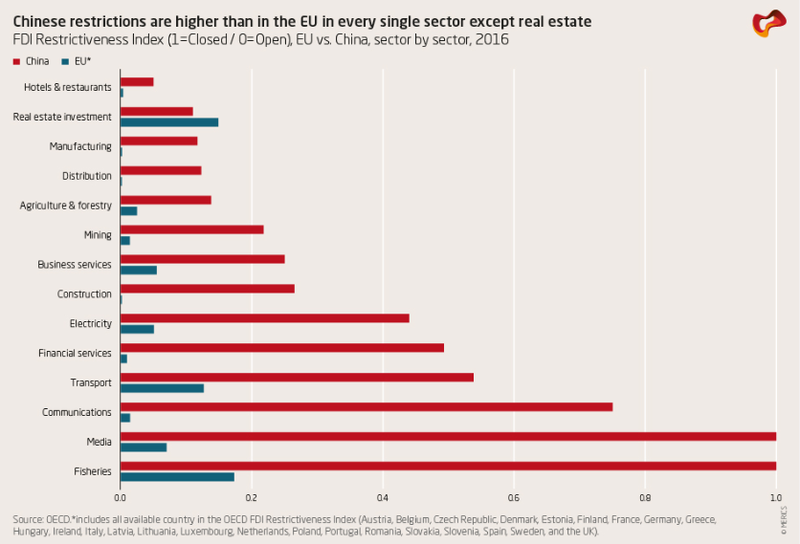 This sector-by-sector comparison reveals that Chinese investments into the EU surpassed investments by EU companies in China in 10 out of 15 industries in 2017. It also finds that the majority of large Chinese acquisitions in the EU would not have been possible for EU companies in China, as Chinese government regulations prevent foreign companies from doing business in the respective sectors. The imbalance is most visible in the transport and infrastructure sectors. Europe continues to be a favorite destination for Chinese investors. China’s global outbound investment declined in 2017 for the first time as Beijing enacted capital controls. Chinese FDI in the EU followed the global trend and dropped to EUR 35 billion, a 17% decline compared to 2016. However, the pace of Chinese deal making in Europe is more resilient than in other advanced economies, and state-related investors are staging a comeback. European FDI in China remains lackluster because of slowing growth and persistent market access hurdles. The level of European FDI in China has hovered around EUR 10 billion per year in the past five years before 2015 and has further declined in 2016 and 2017 to EUR 8 billion per year. Despite promises to level the playing field, European companies continue to face major formal and informal investment restrictions in the Chinese market, especially in sectors with high growth opportunities. By all available measures, there is a significant gap in investment openness between the EU and China. Chinese investors enjoy one of the most open investment regimes in Europe, with almost unfettered access to all industries. China on the other hand continues to strategically limit access for foreign companies in many sectors and there is rampant informal discrimination against foreign firms. The lack of investment reciprocity harms European interests. The lack of reciprocity violates fairness principles that the post-WWII economic order was built on. It also is a threat to efficient market allocation of resources, which can cause serious harm for European producers and consumers. Finally, the perception of China as a free rider undermines popular support for economic cooperation with China and for an open, liberal economic order in Western democracies. Moving toward greater reciprocity is ultimately in China’s own interest: China’s leaders are aware that the current investment barriers not only stoke foreign discontent but are ultimately also detrimental to China’s own economic welfare. Beijing has pledged to level the playing field for foreign investors and it has made some initial progress in removing investment barriers. At the same time, the timeline is unclear and doubts about implementation remain. A robust bilateral investment agreement with China should be the EU’s priority but success is uncertain. Negotiating a robust bilateral investment treaty with China based on a narrow negative list is the best approach to address reciprocity concerns. However, negotiations are slow and China’s latest track record raises serious doubts about its ability to implement tough reforms. Moreover, a bilateral investment agreement may not be able to fully address concerns about informal discrimination and other post-market entry hurdles for European businesses. Europe needs strategies to build greater leverage to respond if China continues to drag its feet. Europe should prioritize Chinese upward convergence to EU trade standards in investment openness. At the same time, it needs to expand its toolkit and create additional leverage. Europe should ratchet up pressure to resolve long-standing market access issues; build an efficient and transparent regime that screens foreign acquisitions for security risks; explore new avenues for competition policy that consider asymmetries in market access; and increase coordination with like-minded market economies.